East Brunswick is a medium-sized town of 25 square miles and a population of about 50,000 people.The northern part is home to Tower Center-twin 25-story towers visible from the Empire State Building.The main highway that runs through the heart of the state,Route 18, has it’s large stretch of commercial centers and diners in East Brunswick. The town’s school system is nationally recognized as an educational standard with its 8 Blue-Ribbon schools. Other attractions are the Brunswick Square Mall and the various farms in the picturesque rural section to the south, with berry and pumpkin picking at Giamarese Farm, as well as the wide selection at the many garden centers on Cranbury Road. Now down to the nitty-gritty. Topping the list of places to stay is the Hilton, sandwiched between the “twin towers”. It is visible for miles down the turnpike and is conveinient for business travellers, as well as whenever any politicians are staying in the area. A Holiday Inn, as mentioned in the 2001 edition, will be completed soon and sits close to the towers near the turnpike. Going down a notch, there are familiar chains such as the Motel 6, (which has just added an extended-stay building)Macintosh Inn, and the Ramada Inn. I have been to all of these and found them suitable. As far as food at these establishments are concerned, I have had Easter brunch at the Ramada’s downstairs restaurant and found the service and price reasonable. 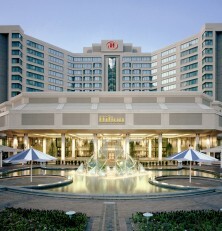 The Hilton is home to the annual high school prom here, and the food is unbelievable. If you don’t believe me, call the White House. From low to high, there are the little strip mall diners that I don’t recommend, that is unless you have a lot of Maalox on hand. There are McDonalds, Miami Subs, Baja Fresh, Wendy’s, Burger King, Denny’s, Roy Rogers, Olive Garden, Chili’s, Chi-Chi’s, Ruby Tuesday’s, Red Lobster, and Applebee’s are all great familiar eateries. Personally, both the Colonial and Seville Diners are great but I prefer the Colonial for selection and price. Very good coffee for the early morning start-ups. The Tomato Factory on Ryder’s Lane is very good but call ahead for seating as theres always a wait. Finally, The Blue Water Seafood Company is a small, elegant, restaurant near the GMC dealership that has the finest seafood in the area. Make sure to come with enough cash and without the kids. There is also the Chateau, but that is on Cranbury Road and is the kind of place you would have your wedding at (not for a little dinner). This is probably where East Brunswick falls short. Entertainment is few and far between for a town this size, but we manage. The movie theater in the mall has 20+ screens, and is a favorite hangout of the high school crowd on Friday nights. There’s a bunch of tanning salons, some arcades, an indoor sports place called Sports N’ Stuff, and thats about it. If you enter town from the turnpike by the towers and the big East brunswick sign, the traffic will bottleneck over the bridge because you lose a lane at the footbridge. If that happens, you can go turn right at Eggers Street at the footbridge traffic light and follow down until you see the east brunswick racquet club on the left of the road. Follow that down to the Toys R Us-then u should be in a parking lot with a Shopper’s World-then you can see Route 18 from there and go back on or continue on the back road near the Mr.Pizza and follow straight past the junior high on your right until you see a cream & red warehouse at the end of the road with a light and apartments on your right. Left takes you to 18, right takes you to Ryder’s Lane and the Acme Shopping Center. This is probably the best advice to give you if you come in during rush hour. Also, for local news turn to 1450 am and 98.3 fm.